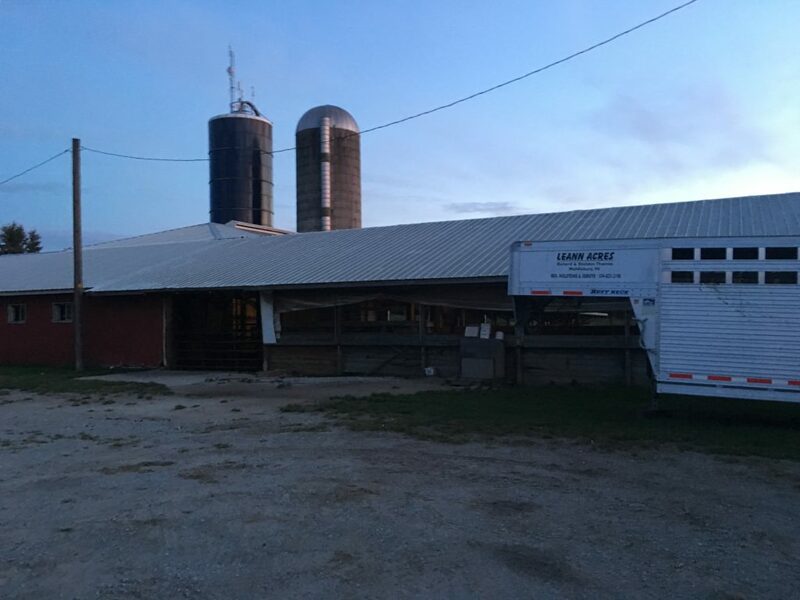 Home to 690 cows, Burdock Hills Dairy, LLC, was established in 1973 by Dan and Mary Javor. When Dan and Mary bought the farm, they started milking only 30 cows. 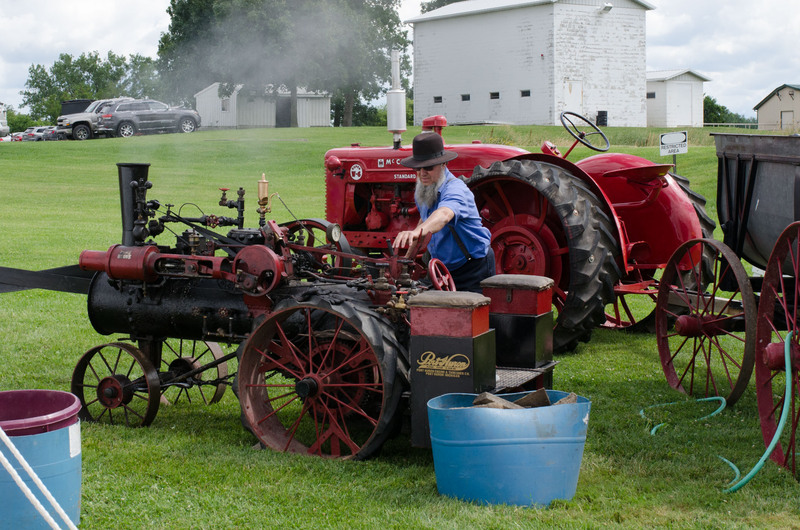 Through the years, they have seen many ups and downs, but still cherish the farmer lifestyle. 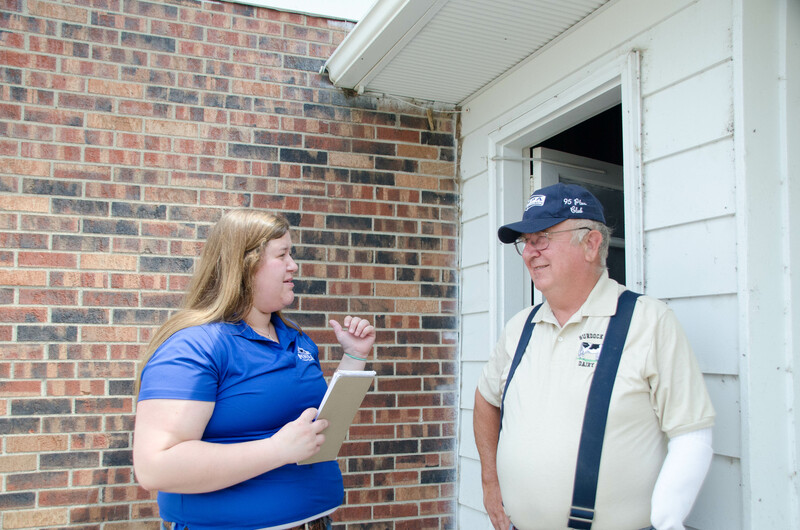 They raised three children, one who joined as a partner in the dairy farm after college. Son, Krist who now manages the field work aspect of the dairy farm and helping out with the cows when needed. 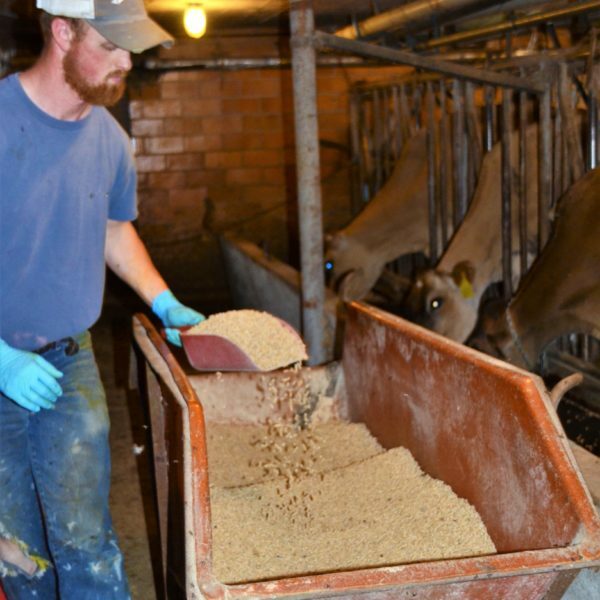 “Some days don’t go as planned on a dairy farm, but I can’t think of any other job that would suit me better. 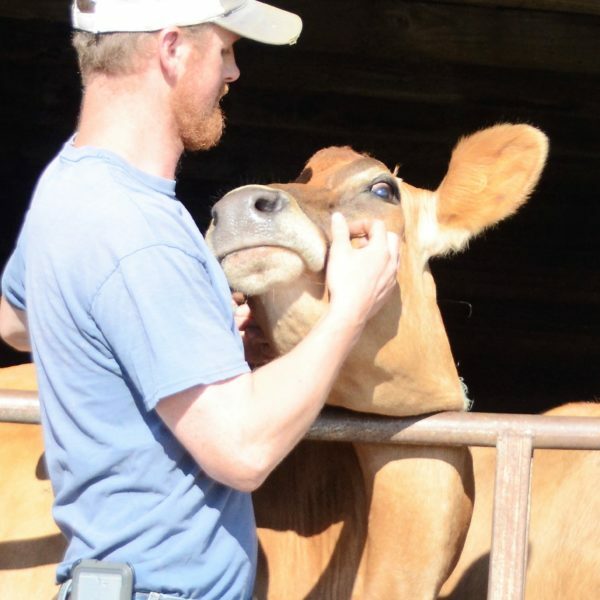 I think many jobs can feel this way to people, except with being a dairy farmer, I get to be my own boss and make the decisions on how to handle the situation and not as a supervisor,” said Dan. Along with milking cows, Dan, Mary and Krist farm 1,200 acres of corn, alfalfa and wheat to feed and bed their cows. The Javor family also hauls their own milk to milk processing plants like Heritage Ridge Creamery which is about 85 miles from the farm. Although delivering milk to a processing plant is unusual for a farm this size, Burdock Hills Dairy L.L.C. prides itself on being involved with the extra step to ensure the milk is the highest quality possible to make dairy products like cheese. 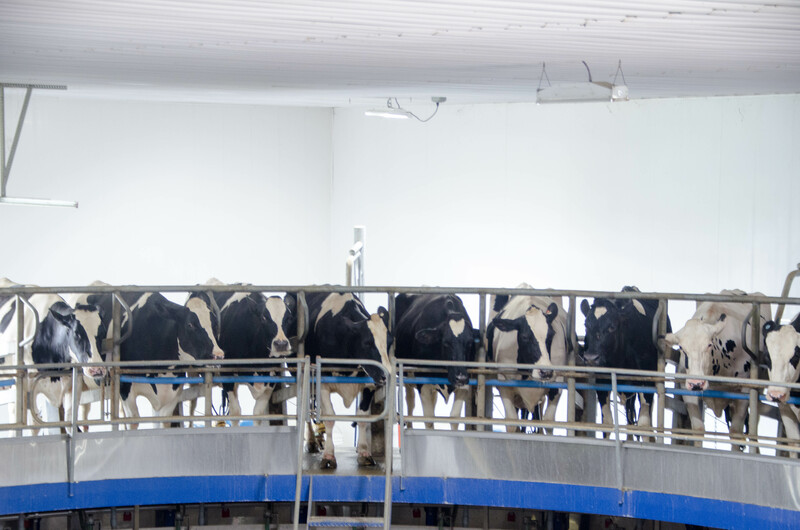 Many farms choose to not deliver their own milk to a processing facility due to extra labor and equipment needed. Cheddar cheese produced under the Heritage Ridge Creamery brand at Michigan Milk Producers Association’s Middlebury, Indiana cheese plant recently snagged a 2nd place award in the ‘mild cheddar’ category in a national cheese contest. The award was presented by the National Milk Producers Federation (NMPF) last week at the federation’s annual meeting in Arizona. The annual contest includes cheese made by dairy cooperatives belonging to NMPF. A record 230 entries from 15 cooperatives were submitted in the 2018 contest. 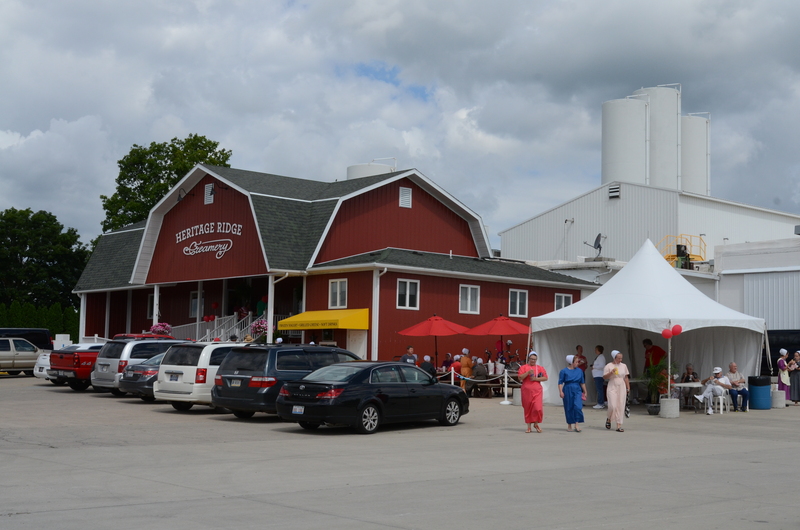 Last year, Heritage Ridge Creamery’s pepper-jack was named the Grand Champion Cheese. The Heritage Ridge Creamery brand markets cheese produced at the Middlebury, Indiana plant and sold in the on-site retail store. The cheese plant produces Colby cheese, a softer, milder flavored cheddar cheese, in addition to cheddar, pepper-jack, Amish Creamery cheese and other flavors. 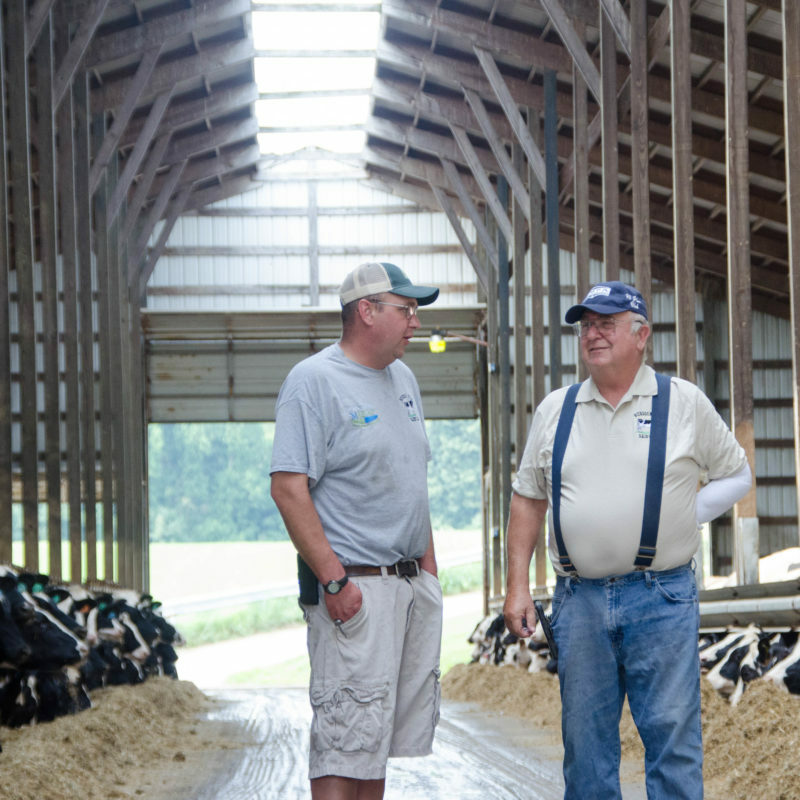 Farming and dairy cows has been the center of Richard and Trula Thomas’ world since day one. Richard bought the farm before he left the service and they welcomed their first calf to the farm a few short days after their honeymoon. Thirty-nine years, three kids and two grandchildren later, they still both look forward to new calves being born. 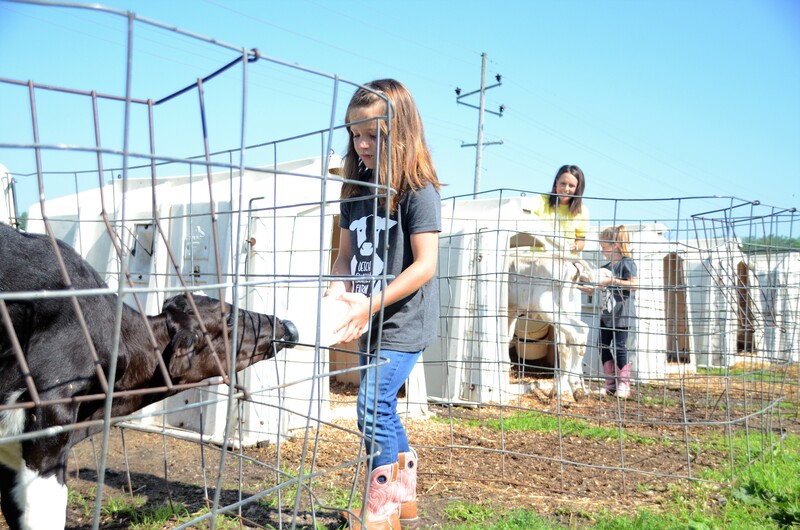 “My favorite memory so far on the farm was when the kids were showing at the county fair. They always wore red shirts and it was so much fun to see them dressed similar and working together in and out of the show ring,” shared Trula Thomas. 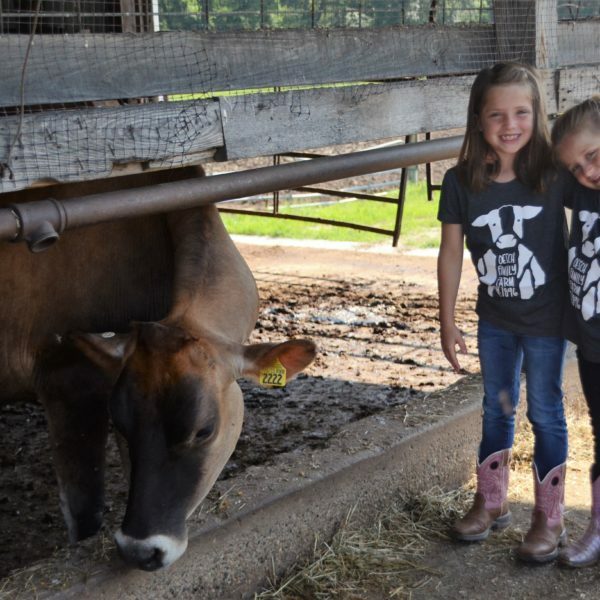 LeAnn Acres—created by using Richard and Trula’s middle names—is home to 120 milking cows who are milked two times a day just eight miles away from Heritage Ridge Creamery. They farm about 200 acres of corn and hay to feed their animals. 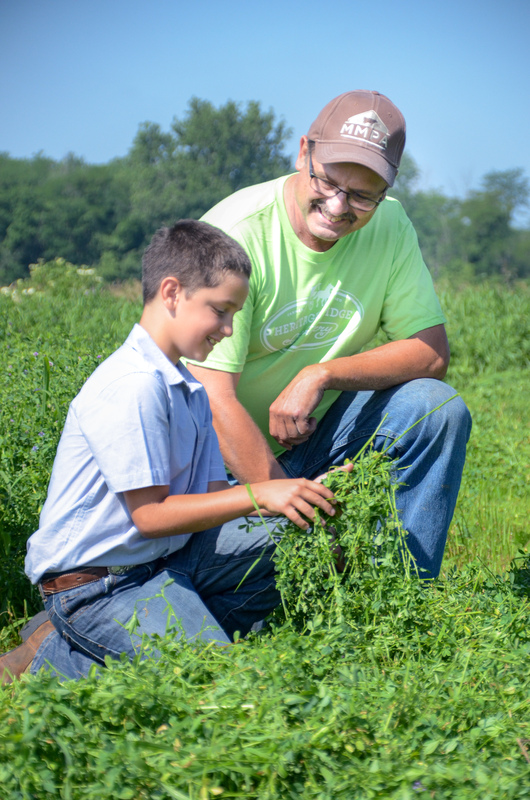 Their son Sheldon, who is considered the herdsman, spends most of his time with the cattle milking, taking care of the calves while Richard focuses on the crop side and the herd health. They all agreed that some of the best parts of dairy farming is the variety of tasks needing to get done on a day to day basis seldomly is boring and seeing the fruits of their labor is truly rewarding whether it is in the show ring, harvesting corn or watching a calf grow up to be a milk cow. “It’s a lot of work with many challenges but reaping the rewards of your hard work and working with family makes it worthwhile,” said Richard. Our friends at the American Dairy Association of Indiana (ADAI) toasted up a fall-inspired “Autumn Fiesta” grilled cheese sandwich today at Heritage Ridge Creamery. 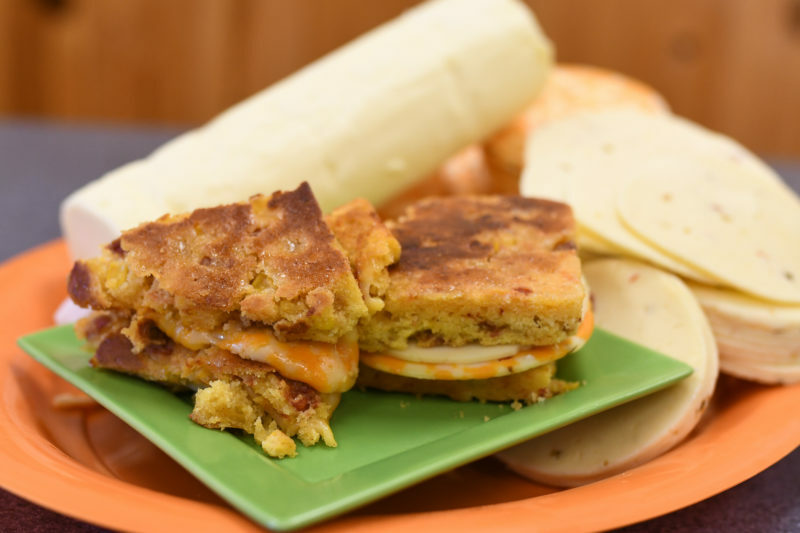 Combining two of our most popular cheeses—Pepper-Jack and Thunder-Jack–this sandwich is an interesting twist on the traditional grilled cheese by using homemade cornbread, MMPA roll butter and hatch-chili-infused maple syrup. Each month this year, the American Dairy Association Indiana features a new, seasonal grilled cheese recipe on a Facebook live broadcast. For October, they stopped by Heritage Ridge Creamery to film their “Grilled Cheese of the Month” Facebook Live event using our tasty cheese and butter. Today, Chef Michelle was joined by MMPA’s Director of Sales, Jim Feeney, and Master Cheesemaker, Jennifer Digman, to whip up the spicy and gooey delight. If you missed the live video, you can watch the recording below. Don’t forget to comment within 24 hours of the video for a chance to win dairy prizes. To order some of the delicious cheese from Heritage Ridge, shop our products online and use code AUTUMNFIESTA for 20% off of your order! (offer ends 10/04/2018). We’re LIVE at Heritage Ridge Creamery with October’s Grilled Cheese of the Month Club recipe—the Autumn Fiesta!!! Comment below before 1 PM Wednesday, October 4th for a chance to win an official Heritage Ridge gift box. For all past recipes, visit GrilledCheeseClub.com — To order some of the delicious cheese from Heritage Ridge, head to heritageridgecreamery.com and use code AUTUMNFIESTA for 20% off of your order! Grilled Cheese You Say? Yes, Please! Perfectly browned crispy cheddar cheese on the outside of two pieces of buttered garlic toast filled with hot gooey gouda cheese. YUM! I was finally getting to try the winning grilled cheese sandwich at the Indiana State Fair dubbed the “inside out grilled cheese” and it was worth the wait. Better yet, the cheese comes straight from Heritage Ridge Creamery. 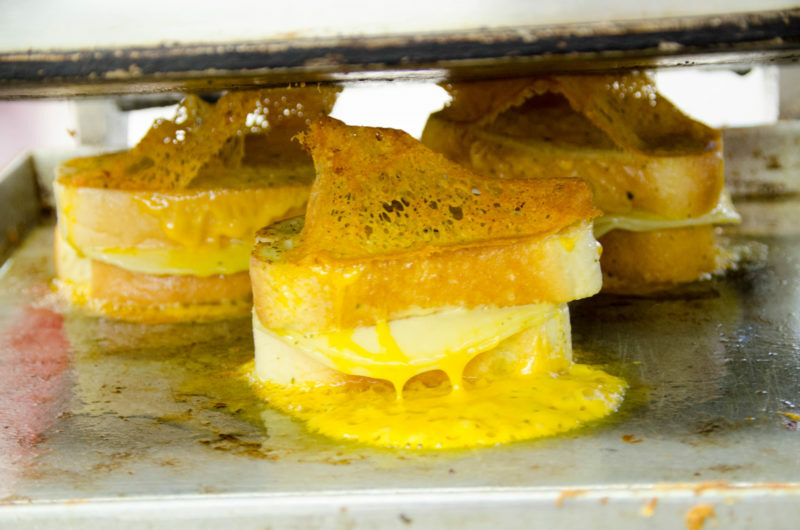 For the last three years, the American Dairy Association of Indiana has hosted the Ultimate Grilled Cheese Contest during the State Fair. The winning entry joins the other grilled cheese options at the Main Street Dairy Bar the following year. Other menu options offered at the Main Street Dairy Bar are milk shakes, yogurt, ice cream, mozzarella sticks, white and chocolate milk, pretzel bites, applesauce and cottage cheese. 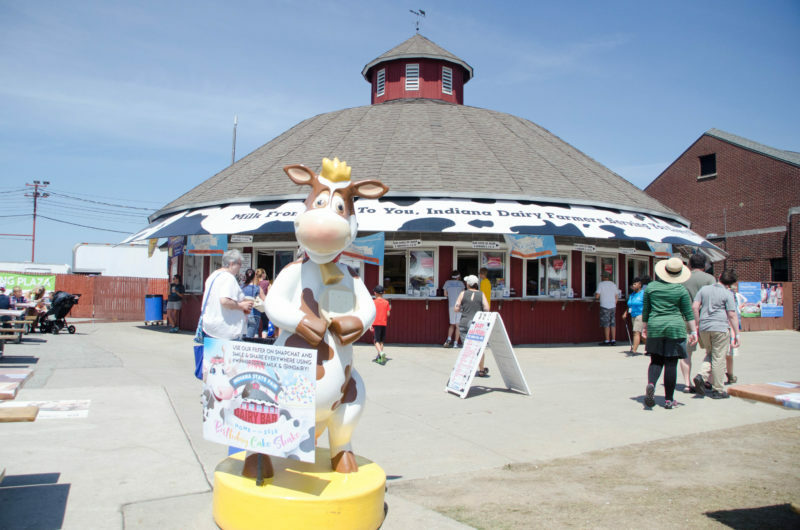 It’s not hard to get your “3-A-Day” of dairy at the Indiana State Fair! 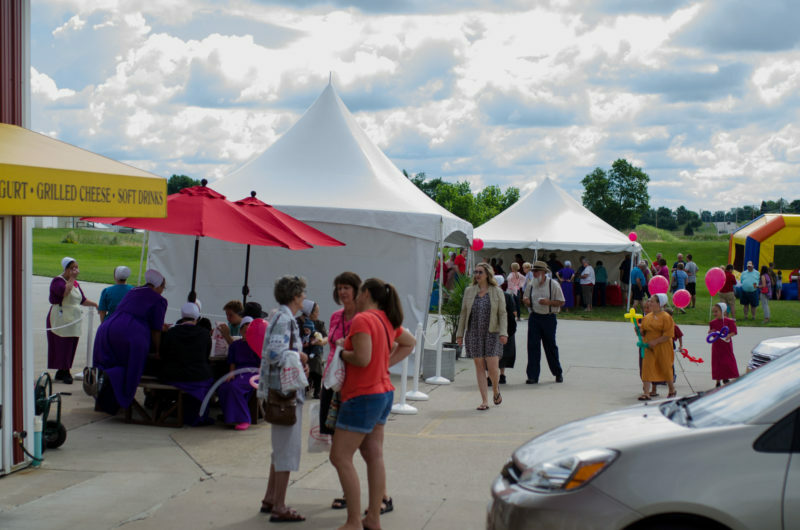 Each day at the Dairy Bar provides a chance for fair goers to get a meal at a great price. For only $6, they receive a grilled cheese sandwich and a milkshake. The Dairy Bar even offers 50 cent cups of milk with only 25 cent refills and sippy cups or bottles are filled for free. “I appreciate a healthy option for meals while at the fair. We always look forward to visiting the Dairy Bar for sandwiches and milkshakes every year,” said fairgoer Jeanie. The best part of the Main Street Dairy Bar is they use Indiana’s own Heritage Ridge Creamery cheese to make the grilled cheese sandwiches. After the Indiana State Fair, come visit Heritage Ridge Creamery in Middlebury to purchase cheese to make your favorite grilled cheese or even create a fun, new combination to enter in the 2019 Ultimate Grilled Cheese Contest using lots of cheese and butter. 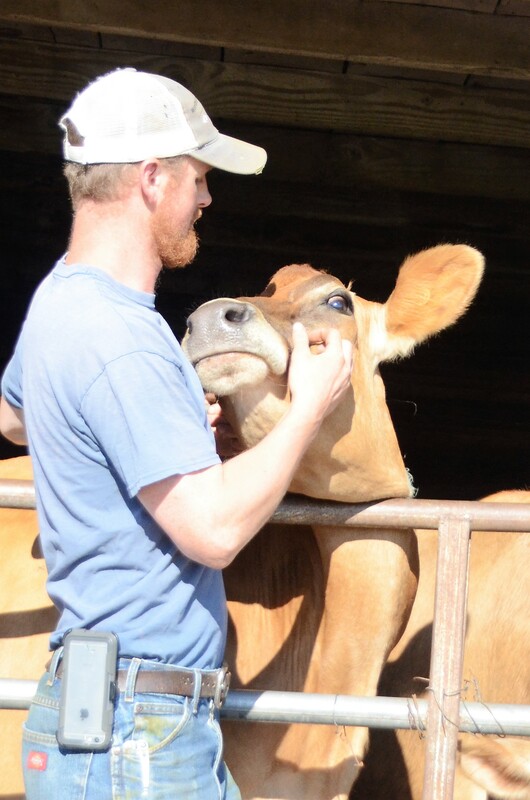 Starting his own dairy farm on October 25, 2014, Jesse fulfilled his dream of milking cows of his own. 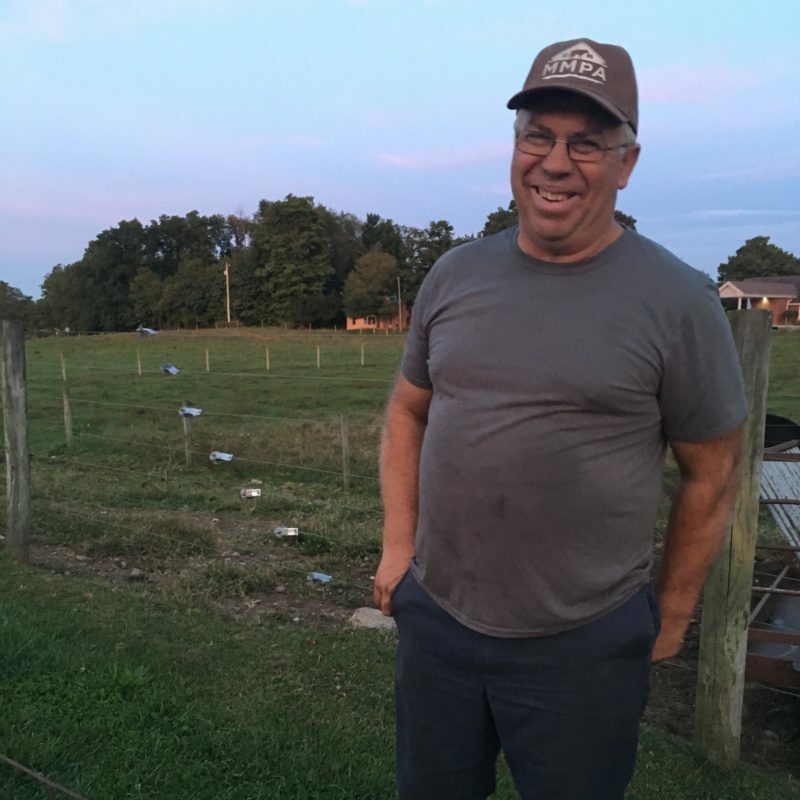 He gained experience from working on two local dairy farms and jumped at the chance to purchase a herd of 19 cows and rent a facility when it was offered. Fast forward to the present, Jesse and Chelsea have expanded the milking herd to 50 cows and have added a daughter to their dream. 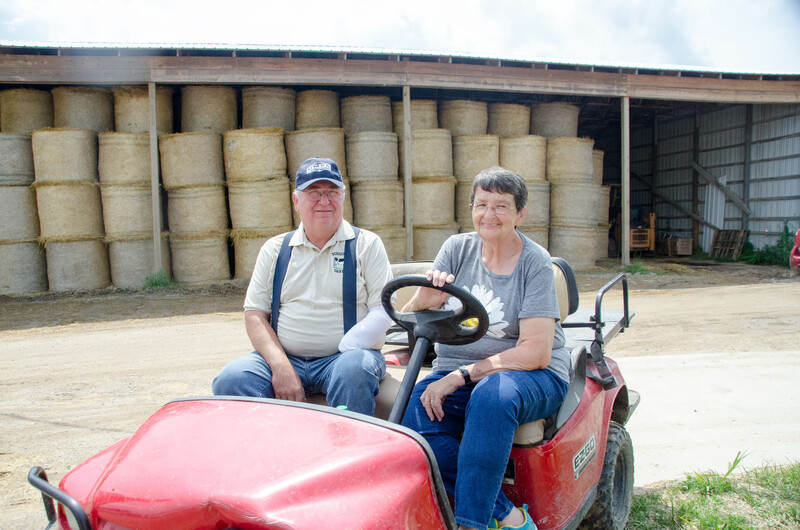 With their milk travelling only 22 miles to Heritage Ridge Creamery, the young couple milk twice a day in a stanchion barn and have 15 acres of hay and pasture for the cows with the help of family when needed. 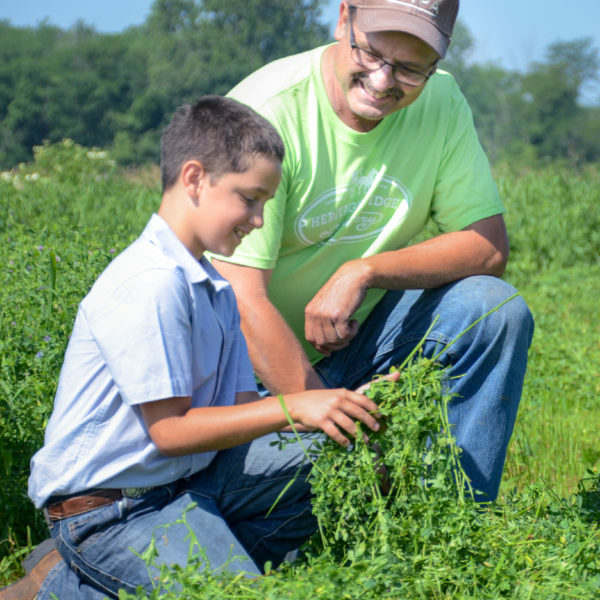 “We are a first-generation farm starting from scratch and learning a lot as we go. We strive to take care of our cows just like they take care of us. Each cow has a name and a job to do. 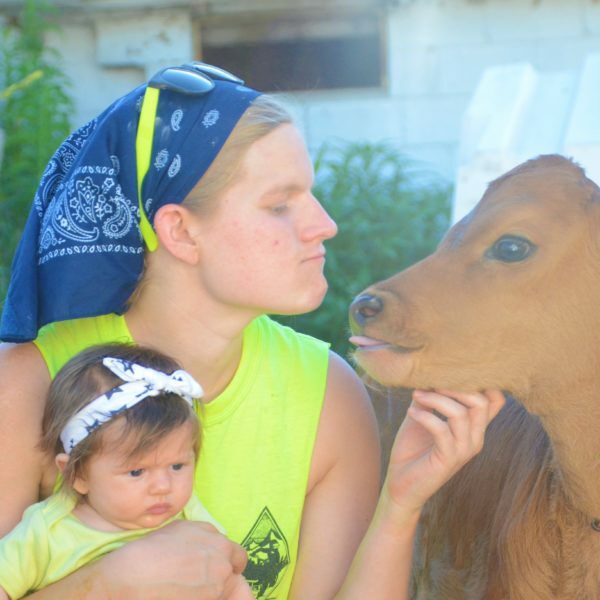 It is such a blessing to see all that we have accomplished so far and can’t wait to see what is in our farm’s future,” said Chelsea. 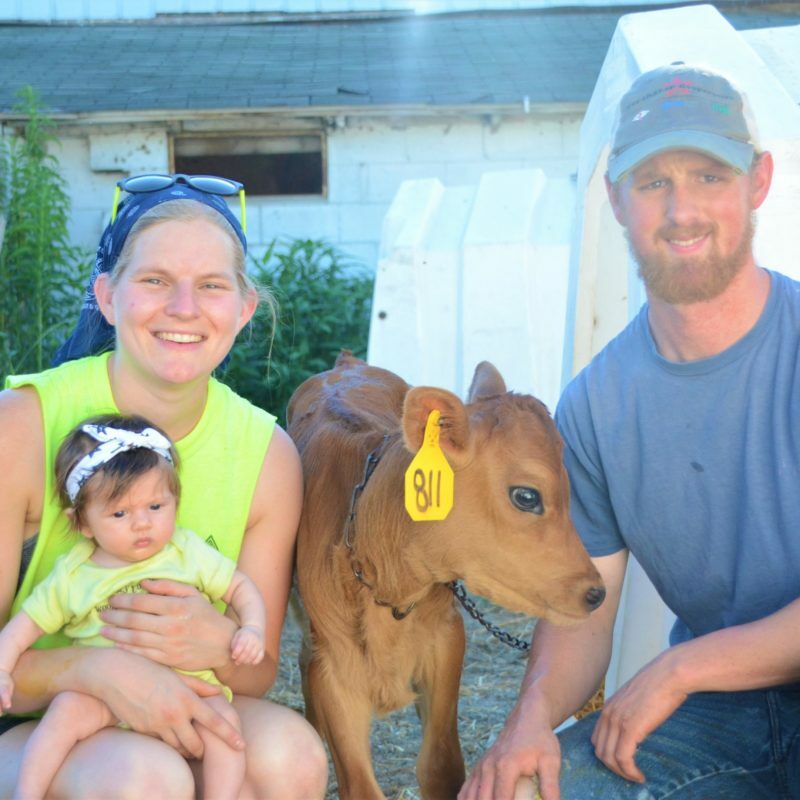 Mike Oesch and daughter, Laura Yoder work like a well-oiled machine together on their family dairy: MyBrook Farms. Along side of them are Mike’s wife Judy, who is in charge of the bookkeeping, Laura’s husband Ryan,who teaches at the local middle school, and Laura’s three children. 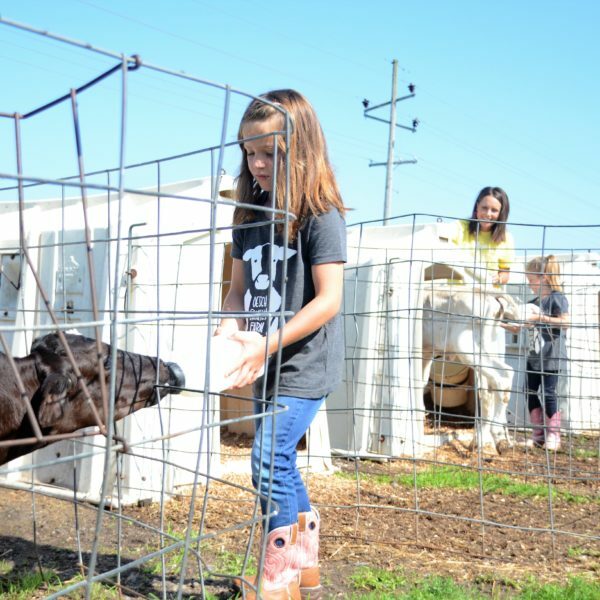 MyBrook Farms is a multigenerational family farm just four miles from Heritage Ridge Creamery. 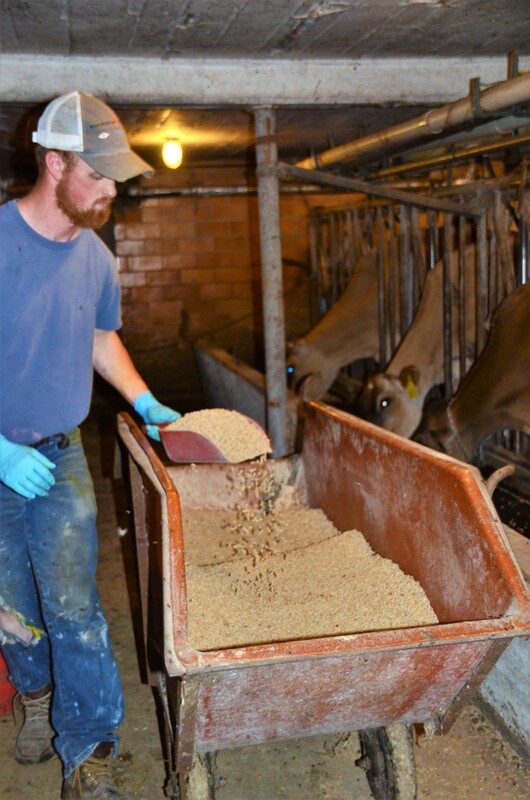 They milk 120 Holstein, Jersey and Brown Swiss cows twice a day in their parlor. 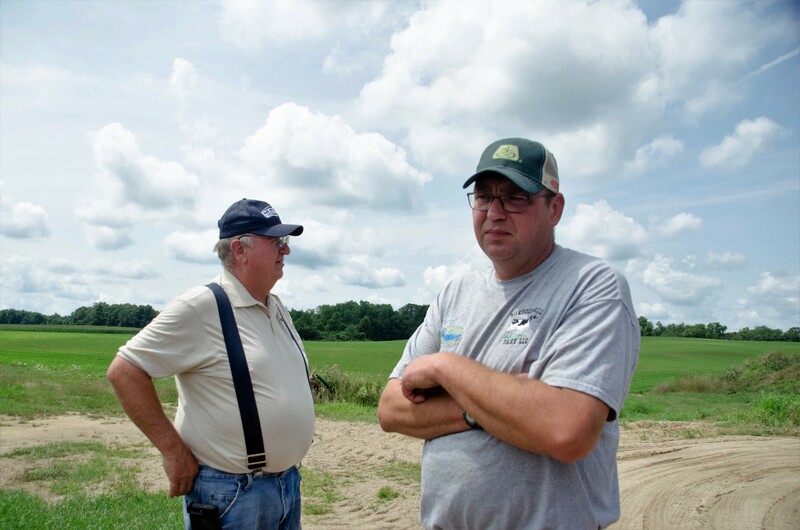 To feed their cows and young stock, they farm 375 acres of corn, soybeans and hay. Everyone works hard to make sure the animals and land are well taken care of. 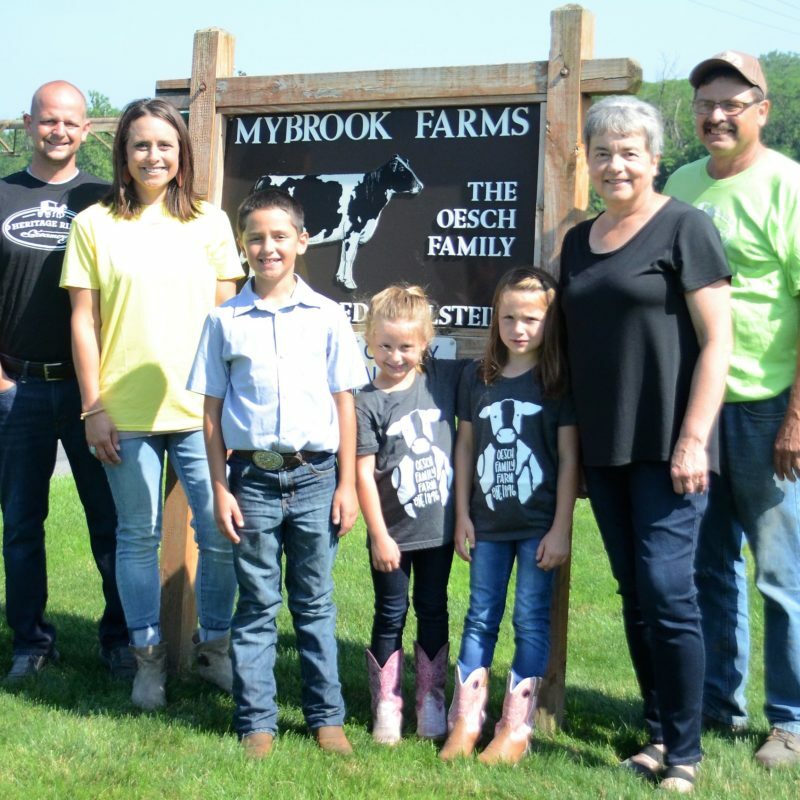 The Oesch’s have been dairy farmers in Middlebury since 1896 and have been focusing on being good neighbors in their community, environmental stewards of the land and of course, treating their cows with lots of TLC. 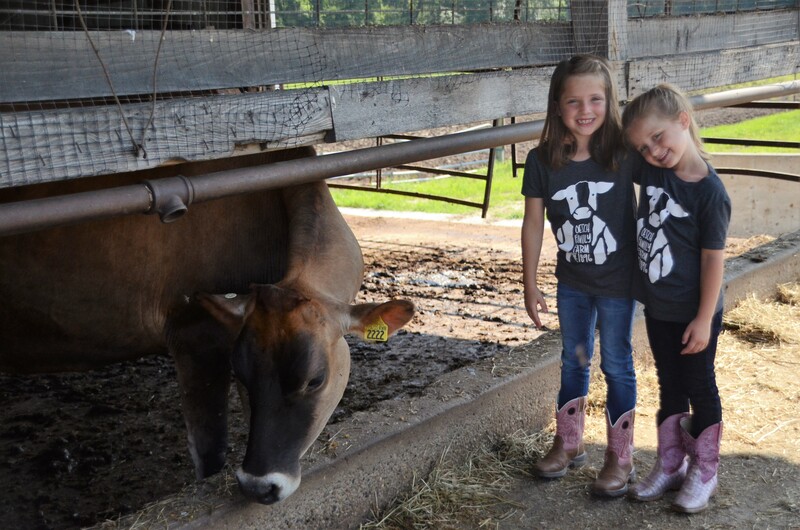 “I have always loved the farm and the cows since I was a little girl! When I was really young, I spent most of my time with my dad outside. When my mom would tell me that it was time to come inside, I would go inside, stand at the back door and watch the cows, waiting to go back out to the farm. When my mom would go to a different room in the house, I would sneak back out to help my dad and see my cows. Now I’m seeing Hadley doing the same thing. I love to watch her eat her meals quickly in order to get back out to the cows and get back to work! 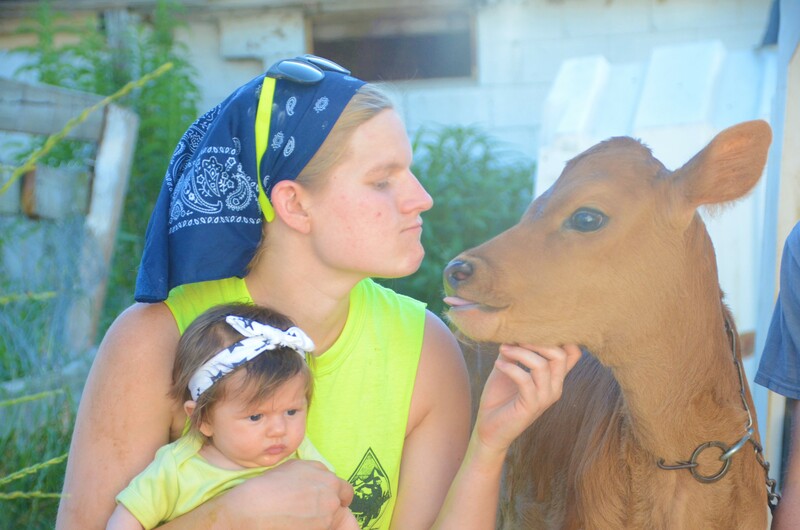 Dairy farming is truly not just a job to us, it is a lifestyle,” said Laura. While cheese may be our favorite dairy product, on June 1 at Heritage Ridge Creamery we are drinking milk in celebration of World Milk Day. Today is a great time to raise a glass to the farmers who work hard 365 days a year to provide fresh, high quality milk! 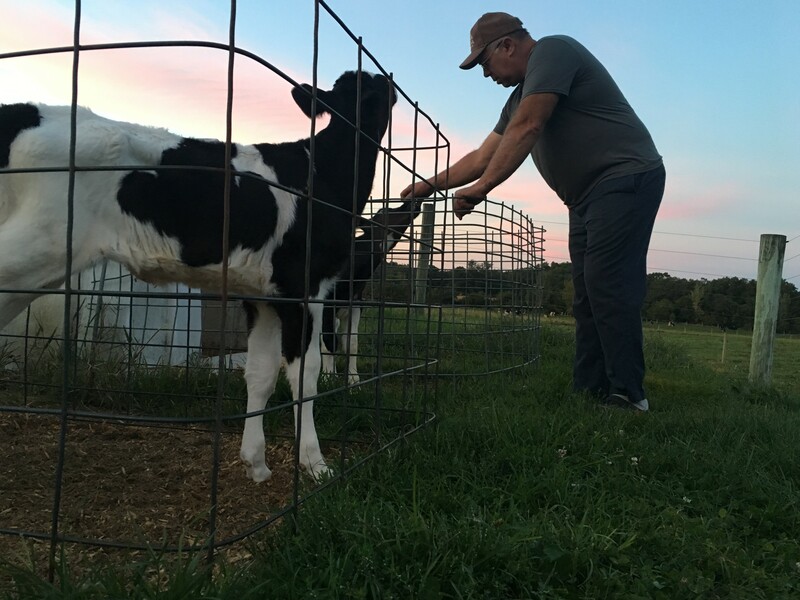 Heritage Ridge Creamery is proud to be owned by dairy farmers who are so passionate about their farms and supplying us with healthy and delicious milk. Let’s celebrate! Pour yourself a glass of milk and toast it with us! 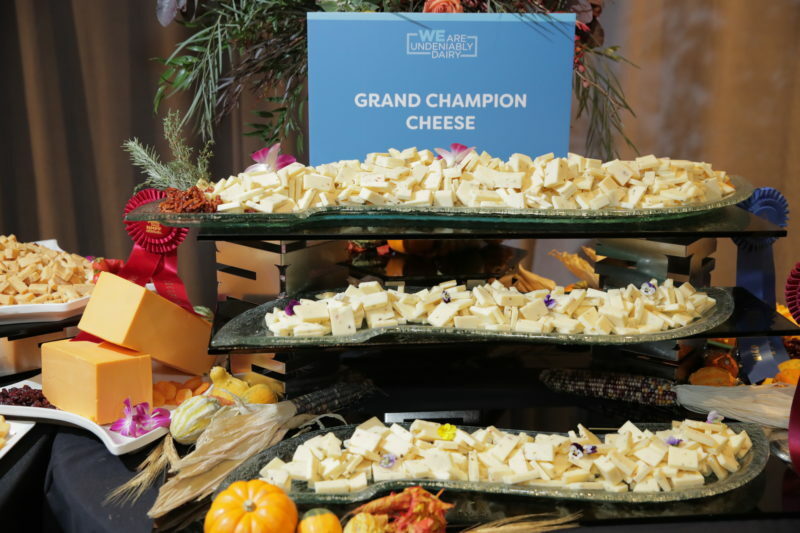 Pepper-jack cheese produced under the Heritage Ridge Creamery brand at Michigan Milk Producers Association’s Middlebury, Indiana cheese plant was recently named Grand Champion Cheese. The award was presented by the National Milk Producers Federation (NMPF) last week at the federation’s annual meeting in California. The annual contest includes cheese made by dairy cooperatives belonging to NMPF. A record 194 entries totaling 3,070 pounds of cheese products were submitted in the 2017 contest. 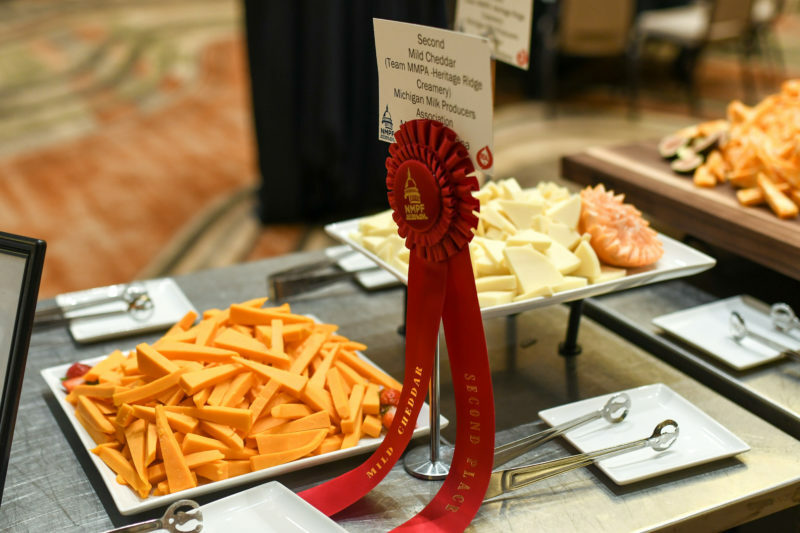 Heritage Ridge pepper-jack placed first in the hot or spicy cheese category and then went on to win the overall best cheese prize. This is the first year MMPA has entered a product in the cheese contest. Heritage Ridge Creamery is a brand of Middlebury Cheese Company, LLC, a wholly-owned subsidiary of MMPA. The farmer-owned cooperative acquired the facility in 2016 and is currently reviewing options to increase capacity and expand product offerings. 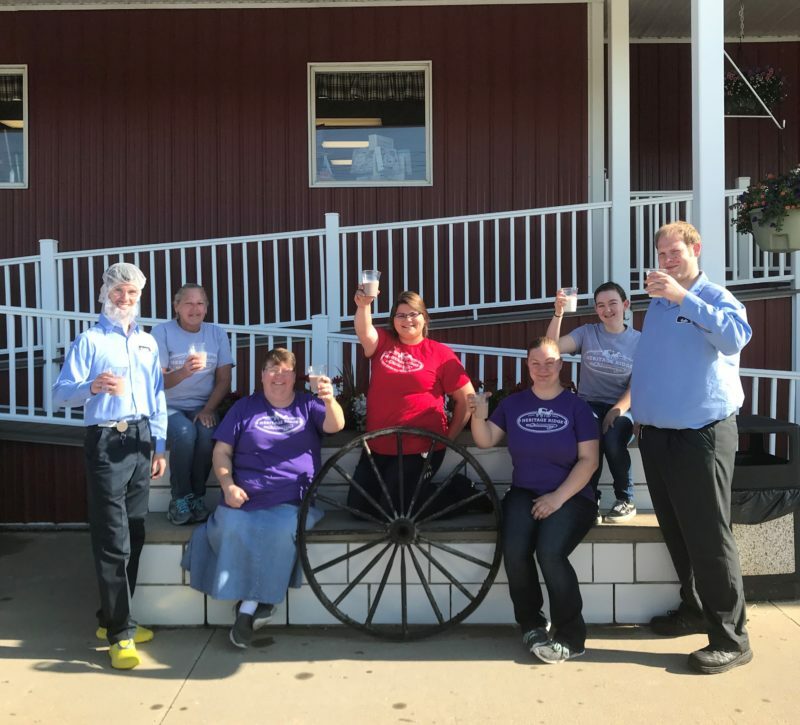 Over 2,000 customers visited the Heritage Ridge Creamery store during the community event, enjoying free ice cream made with a steam powered engine, activities for children and store specials. In total, 1,250 cups of ice cream were served throughout the day. One lucky attendee won free cheese for a year in the annual raffle.